What better way to commemorate a player or a coach than with a beautiful embroidered patch? These days, many baseball teams create their own special patches to wear to commemorate someone important to the team. For example, in 2009, the Philadelphia Phillies wore a black circle patch with the letters “HK” on it to honor the team’s long-time sportscaster, Harry Kalas. Commemorative patches can also be used as a form of praise or thanks; you can create a beautiful, unique patch to present to someone who has done something special for your team. 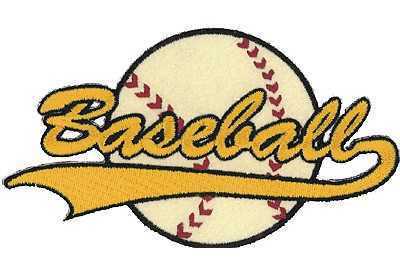 Embroidered baseball patches can easily be used to add a little pizazz to team uniforms. Because you can sew them onto fabric, your patches can be worn on any article of clothing, whether it’s a baseball hat, a shirt, a pair of pants, or even socks. This means you can sport your team logo, mascot, name, your city or town, or even just a cool design. If you’re looking for a unique way to get your teammates and your fans into the spirit of winning, why not create your very own rally patch to hand out? You can feature your team name, mascot, or logo and the upcoming team(s) that you want to beat. It’s the perfect way to get everyone excited for a big game, whether it’s against the local middle school or it’s the national championship. Once baseball season comes to an end, you’ll probably look back on all of the great times you had with your team and the accomplishments you achieved. To harness the memories and to keep the spirit of the game alive in the off-season, you can design a one-of-a-kind tribute that lets you remember your season for years to come. While patches are used by people all over the country, many don’t realize how artistic they really are. Our embroidered baseball patches are works of art and can actually be displayed on a wall or shelf as a beautiful decoration (instead of simply being worn). This means they make great gifts for baseball lovers. Whether it’s family member who’s been a life-long fan, a coach who made a difference in your life, a memorial for a teammate, or another occasion, we can help you create a patch that says something significant. Whether you’re a player, a coach, a parent, or simply a fan, why not wear your pride or support? You can design a patch that represents your baseball team and display it on your clothing, jacket, backpack, hat, duffle bag, and more. With the bold and bright colors we use at American Patch, everyone will know which team you support. This entry was posted in General Information and tagged artwork, baseball, embroidered, memorial, sports, uniforms.